Below is a Slideshow for our Menu in for Coach's Pub and Eatery in Inverness, FL. We are proud of our large selection of great food including Steaks, Chicken Wings, Burgers, Wraps, Salads, Nachos, Fish, Soups, and much more to choose from. Don't forget to visit our SPECIALS page to see Our Daily Specials. We look forward to seeing you! Copyright © 2016. 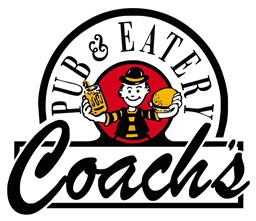 Coach's Pub and Eatery. All Rights Reserved.